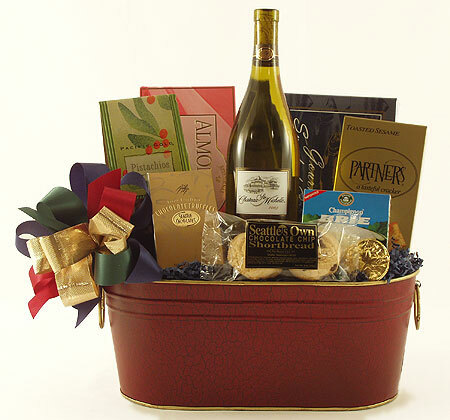 Fine Washington wine and Northwest gourmet foods are paired for those who enjoy the finer things in life! A handsome oval burgundy metal tin is filled with Ste. Michelle's Chardonnay Wine, Portlock's Smoked Salmon, Brie Cheese Spread, Partner's Walla Walla Onion Crackers, Outrageous Offerings Chipotle Cashews, Brown & Haley's Almond Roca, Seattle Chocolate Truffles, and Seattle's Own Shortbread. A great choice for any occasion! Available with wine, champagne or sparkling cider.